LooLoo13's review (This content has been automatically translated from French)" The big fat"
Multi thoughtful internal effects (2 +2 per track back two master) list of effects that s the stuff As of SHIFT. Editable sounds a configurable wish. Intuitive step-sequencer recording very simple wholes automations and melodies on the fly. 16 pattern on 4 banks to change all that. Slide pad to control and filter effects bitcrusher repeat the Master. Clear and legible menu preferences. The app is very clear no need for manual in case of trouble I shall be only too you advise regader the tutorial 8 of Franco la muerte that will brighten all your lanterns. Very quickly seduced by the use of SimpliciTee the number of control and modulation possibilities. bill are more than adequate. The use of its own samples and sound banks will be much more interesting. Any type of kit eternal LINN TR ... to more current kit there for everyone. and the least I can say is that I didn t was disappointed. I love the classic BAR Type 909 but I find some interest in new types of production tools such as spark or maschine. Spark a very good compromise at an affordable price. Finally the most important orientation sonoritées the beat-making and the price used to make me really SPARK indispenssable a current home-studio. 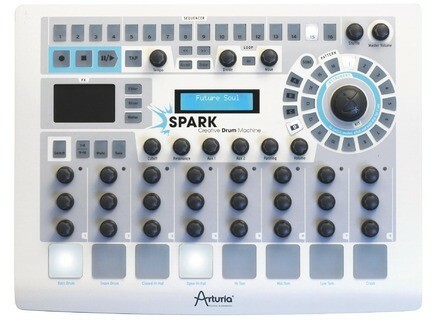 PS: the big question SPARK or MASCHINE I find them quite different in fact I do not really understand the debate. jonathan44's review (This content has been automatically translated from French)" favorite on the spark"
I am using my spark with an average hp pavilion dv7 laptop, it runs very well even if I want to change the pc for more fluidity and thus push the software to its connection maximum.niveau c moi.le is perfect for a single default my taste is the lack of a current even though many efforts have been made to the side, thank you simon carter (Crystal Distortion) a very good idea to ask for underground artists. worthy configuration good old Korg much more opportunity, I would simple ergonomique.l edition of the sounds is in my super easy way, regarding the effects I prefer designe of sparkle or you can assign a single effect on a single pad facilement.sinon a clear manual. sounds suited to my style of music, especially on the last update: dub step, drum and bass, techno and dub.meme if compared to a native maschine in it makes little sounds I find good quality in all . sounds are realistic in all because I bluff musician friends all jours.sa lacks a bit of string instruments, guitar, bass etc. A small flat on the aftertouch response and sounds to the keys. I used the last more than 2 years before I had several Korg EMX1 esxi, the roland 909 505, the yam rm1x etc. .. what I like about this machine is its c sequencer and effects as well as one, easy and affordable software has in the belly if you want to push a technology anymore loin.un its value for money no doubt! again this choice?? the course because I love my spark. Jean Bonbeurre's review (This content has been automatically translated from French)" Good box!" Hard controller with Software PC / MAC compatible. MIDI In and Out on the controller. 1500 + instruments with different complete kits. The sequences can be constructed on the fly, via a type TR sequencer and mouse via the GUI. Installation is very simple, no worries or other rights, everything is done correctly. The new browser allows you to enter more than just spark 1.5 to change kits / projects / instruments, loading them is almost instantaneous, saving time, more production. I think it sounds good, not too cheap. I used RS700, RM1X, Electribe, and some rhythmic sequencers software (hydrogen), I have unfortunately not been able to compare a maschine or the akai mpc, but the boxes tested, this is by far the machine which I easily create rhythmic and inspiring. The carrier is arturia reagent. wxc's review (This content has been automatically translated from French)" It's great!" What connections (audio, MIDI ...)? He has an effects section? How sounds, styles available? Are they edited? Through a utility Mac / PC? 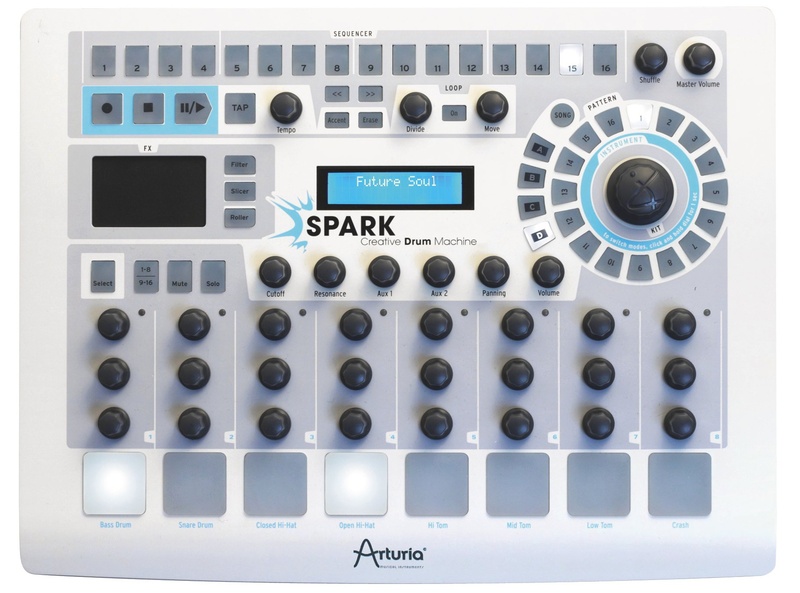 The spark is delivered with great sounds, and can download other Arturia expensive, but I mostly use my own sounds. I use pro tools 11 and I test at the same time the new Spark 1.7 beta 5 software that works very well! Yes everything is very simple. The sounds they suit your style of music? Yes it is his as I buy! 808 rpm can not be top but with a bit of work you get a fix it, but the sounds are not the perfect copy but you have to work on it to get something very good! I love everything made, I dreamed for some time! djfacile's review (This content has been automatically translated from French)" But less well as NI Maschine or Electribe"
# The screen is not terrible terrible, however the interface is impeccable! The manual is thick but really not necessary! The sounds are very good in all but n # there is not much compared to 16,000 in Maschine. You will need to import your own, but there may be large differences in quality and volume! I use 4 Months, But after having tried the Maschine Native Instruments, I immediately sold! Latency is noteworthy is the reaction of the pads. Face Maschine it is unfortunately not the weight! Good Product for 300 Euros secondhand, although NI Maschine Mikro between 199 Euros and has even secondhand Spark to 300 Euros, the choice to wear Maschine. Not with the experience I would do that choice, however it is a machine which can be very interesting in a future version will be more convincing. Do not count on almost Patterns program is very hip hop R # NB, ca reminds patterns of the EMU MP7! The spark she seduced very quickly at first, but you get tired very quickly to only 16 songs with sounds .... Damage, but Arturia should be trying to work on Spark MK2 .. patience, but there is work to catch up Maschine or Akai renaissance novella ... They should consider is the style guide Beat Thang on battery, independent and with a good sound bank .. But the little fifty parts kits has 16 sounds Arturia is Skinny Cow .. especially since they are more hip hop electro Techno (Case of Gout, but Arturia Analog synth which sells to the moog, I do not see # this too that it took them want to go on the field hiphop, especially with 8 pads Poor (Note Invoice excellent however, I love the quality of the pads!) ...) is 479 Euros, think there 2 times for 300 Euros ... Because we can not afford one secondhand Korg Electribe esx which is much more efficient to live the small Grenoble and uses 250 sounds live ... not 16! Maschine Mikro is currently 199 Euros! 2toki's review (This content has been automatically translated from French)" a killing"
I use it in Live 8 in vst. I made deep techno, so the kit oldscool are perfect. everything is editable with amazingly simple. stand alone or VST is absolutely awesome. everything is clear. publishing this fact very easily. drag and drog mode is awesome. perfect for my style of music. I use it for 2 months, c is the central machine of my configue. manufacturing is super nice and quality. this is the Arturia. I'd love that she can stand alone sent a twelve o'clock clock via its MIDI port. history really optimize its use. it can be expected in the next update. this machine is the perfect cross between hard and soft. I am satisfied for now, is the most .. AC drives ..
AC leaves much to the imagination ..
and the feast of having the knob of stored above each pad is really well thought out .. we can easily adjust each sound independently and create loops really rich sound. I do a lot of electronic music right now using analog synths more or less old enough color so hot, and spark up to ca largely I think because the sound is powerful, just as aggressive pr sound heavier than a mild directory hottest hip hop, pop show. SERIOUSLY I CAN NOT do without it!! namely that banks are very rich may have downloaded extensions or pack in more .. I was pleasantly surprised by the samples offered by having ambient sounds of the instruments that limit see the full blow of the rif battery perfectly. I remember hours spent Colé above the spark, it can limit itself to sufir itself is addictive and all of outstanding quality, that's what's right, it sounds powerful and incredible clarity c ' is perfect. I use it for 6 months and I no longer compose a song without yet I made recently of pop, hip hop and ca's always great. sorry I just broadens the subject but anyway go there it is blessed bread!